Huge ranges of lining fabric and colours, from low cost machine-washable anti-static polyester (good European quality) through silky-feel acetate (best dry cleaned), to pure natural silk habotai (hand wash or dry clean). 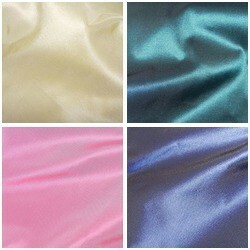 From wedding dress lining for bride and bridesmaid, to fabrics suitable for lining skirt or prom dress, jacket or coat. Linings make clothes more comfortable, less see-through, and easier to slip on and off.